You’d never know this is a problem, though, when you start looking at cars on manufacturers’ web sites. 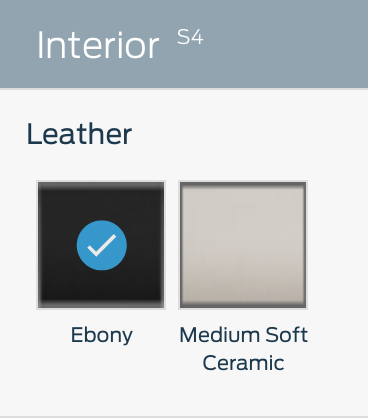 Visit most any car maker’s web site, and for most any car you’re interested in, you’ll see a mix of available interior colors—black, grey, tan, brown, red, etc. Using the ubiquitous configuration tools on such sites, you can mix and match your exterior and interior colors to get what you want. (Not all interior colors will be available with all exteriors.) For me, of course, I build with light interiors. But if you want to actually buy the car you’ve designed, and you like light interiors, you’ll find you’ll probably have to custom order your vehicle. Why? Because dealers (at least in the USA) don’t stock the light colors. To demonstrate how hard it is to find light-colored interiors on dealers’ lots, a while back I looked the dealer inventories for Audi’s A3 Sportback e-tron and Ford’s Fusion. Overall, out of 555 vehicles, only 53 had non-black interiors. Those aren’t good odds if you’re looking for a light interior vehicle. At first, I thought this might be a regional thing, so I looked further at the Audi dealers: I was certain that the mix would differ in the super-warm desert cities of Phoenix and Tucson. Nope; Phoenix had two of 25 non-black interiors (8%), and Tucson had one of five (20%). Intrigued, I then expanded my Audi search to every dealer west of (and including) Montana, Wyoming, Colorado, and New Mexico. That’s 62 dealers with an inventory of 752 e-trons. What did I find? Pretty much the same thing: 89.5% of the 752 cars have black interiors. I then spot-sampled some dealers on the east coast, and found the same general mix. Why is this, you might ask? It’s because that’s what the dealers order, because they look good in showrooms and don’t show as much wear from test drives, apparently. Have I mentioned how much I dislike black interiors? One of the reasons I usually custom order. Exception was when my first generation Prius died. I’m finding the exact same thing. It’s very frustrating as black leather burns the crap out of our legs in the south. Doing a search for vehicles with light gray or tan severely limits my options. The black color is always attractive and look gorgeous. I saw many car lovers choose a black color car with black interior all the time. Kia doesn’t even offer anything but black interior (we replaced my husband’s car last year) and the makes and models I have looked at this evening on the web have had only black or very,very dark gray as a choice. I live in the desert. It is hot, it is dusty, dust and sand really show up on black. I don’t like dark colors for the very reasons you stated. I have an 18 year old Suburban and have had other sedans that had a medium gray interior that held up through 5 kids and much use. I can’t imagine what black would look like. My husband has to put in a fair amount of time vacuuming his car where no one has sat. Glad to see someone else shares the same opinion about the lack of options in auto interiors. Even when some manufacturers offer a “light” option, the interiors are still oppressively black & claustrophobic. What happened to the browns & beiges one could get in the past? For me, a black interior is an automatic deal breaker. I bought 5 new Chevrolets all with tan interiors I still have the last 3; 1997 Dually, 2002 Tahoe & 2003 Corvette. I won’t buy any new vehicle than doesn’t have a tan or a light color interior. The first 7 vehicles I owned had black interiors, but I’ll never, ever buy another – too hot, shows every speck of dust, claustrophobic, gloomy and cheap looking. The real reason the manufacturers are making everything black is economy of manufacturing. Then they only have to stock one color of each part and can use them in every car of that model model. I was in plastic molding as a career. Black is one of the cheapest colors of raw materials. Imperfections and impurities don’t show in it. But the manufacturers aren’t telling this part of the story, nor are they passing those manufacturing savings onto the consumers. BLACK INTERIOR IS DEPRESSING……MISERABLE IN HOT WEATHER……..ABSENT OF CHARACTER, NON INVITATIONAL……..NO THANK YOU! I have been looking for a white SUV or truck with tan/brown interior with the options I want. Everything is black interior!!! So frustrating, I hate black interiors!!! Does anyone know of a 2017-19 subcompact car, other than Fiat 500, that has a tan, beige, cream-color interior? Thank you. I’m not sure where the subcompact class stops, but you an get a Mazda 3 with a light interior…but only in the Grand Touring trim level. Ford Fiesta can also be built with a light-colored interior, as can the Honda Civic. So there are some, but certainly not many. Australia January 2019. Looking for a new car and black interiors are everywhere. Today I had to get out of a black leather interior because it was so excruciatingly hot. Black cars and black interiors are so inferior heat and cleanliness wise. Black interior is a deal breaker for me. To anyone who loves black-let me come to their home and install black floors, black walls and black furniture and see how they like it. And it does no good to have other color seats. When you are driving, those colors are behind you and you are still facing black. If auto makers would put a little more color and life into an interior (with dash), I think they would sell more cars.